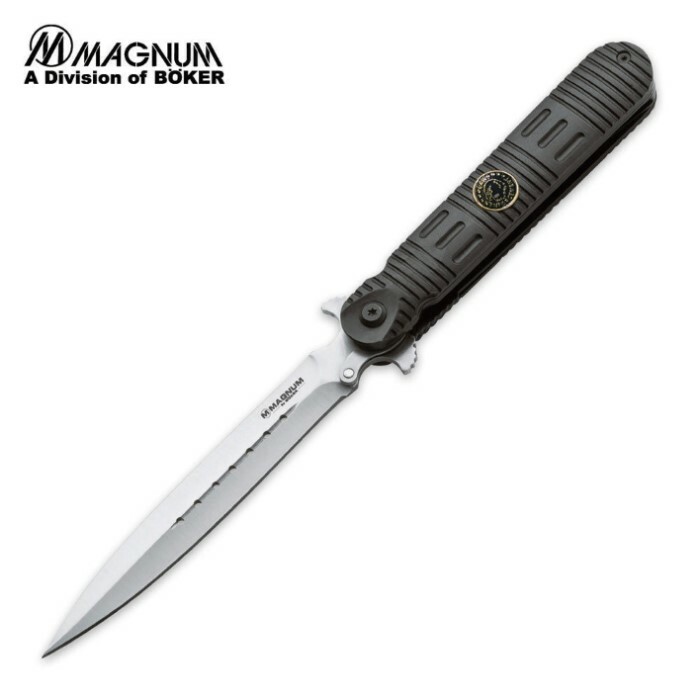 Boker Magnum LE Pocket Knife | BUDK.com - Knives & Swords At The Lowest Prices! An extraordinary knife! The slim 5" blade, made of 440C stainless steel, is clearly longer than the handle. Thanks to an ingenious technology, the knife can be handled in the closed position, despite the unusual proportions. The blade protection mechanism automatically slides out of the handle when the knife is folded and covers the tip of the blade. The black handle is made of anodized aluminum and bears a law enforcement emblem. The unique pocket knife also has a liner locking mechanism. In case you didn't get it the first time - this is one extraordinary pocket knife! This blade was designed with the perfect specifications to fit in the right front groin pocket of my 511 tactical pants pocket with the blade guard peeking out at the perfect spot to grab it 0ut super fast & easy. That said, this knife is the sharpest knife I own, It could easily shave the chrome off the car bumper of a 1957 Ford Thunderbird! !...I easily give this special weapon a "5" ??????????rating. Knife is well made and only thing id do is make a fine black case for it.. This knife is just straight badass! It usually won't open if you just hold it in your hand and try and open it and that is because how you hold it, your hand usually touches the mechanism that slides out to protect the rest of the knife. But you can still open it with a slight flick of the hand which isn't a problem and makes it even cooler. The knife has a great weight to it and the blade is menacing and just a little bit of sharpening made it razor sharp. Overall awesome knife. this is an excellent and strong knife.if you open the blade and the liner lock is not centered on the back of the blade it will center itself if you stab into something,i used an old wooden bench. this is very comforting,the lock is designed very well.i wouldn't want that blade closing on my fingers!!! The Boker Magnum LE is an excellent knife,440C is like having a razor blade for a knife blade and is very easy to resharpen.I ordered two on one the blade was backwards,the Boker logo is on the backside of the knife,but a wonderful knife anyway.The Boker LE is not the first of it's kind,it is an exact copy of a Tac-Force speedster that has been on the market for nearly two years,I have one it's spring assist and a good knife,the blade is 440A.So the ingenious technology belongs to Master cutlery. Thank you Daniel of Nebraska. Very good knife, just needs a belt clip.